Sivan performs a medley of Selena Gomez’s song Hands To MySelf and Justin Bieber’s Sorry. 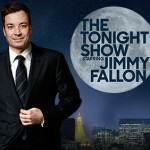 The performance is a web exclusive for The Tonight Show Starring Jimmy Fallon. Sivan performs his single Youth on The Tonight Show Starring Jimmy Fallon, his debut television performance. Sivan talks about how he wrote his album Blue Neighbourhood on The Tonight Show Starring Jimmy Fallon. This is a web exclusive for The Tonight Show’s YouTube channel. I wrote it in a lot of places like garages and apartments and bedrooms and hotel rooms and stuff like that. One of the songs the power went out during the writing session in the hotel room and we had a bus show up outside that was powering the whole hotel and I’m pretty sure you can still hear in the song a very low hum of this bus. How I Wrote That Album: Troye Sivan "Blue Neighbourhood"
Willis appears on The Tonight Show as Donald Trump. Falon shows images and a video of Willis’ movies with Trump’s hair added in. It suddenly had just seemed to grow exponentially. Davis appears on the cover of the Sports Illustrated swimsuit edition which is unveiled on The Tonight Show Starring Jimmy Fallon. I told my mom there was no way I’d get the cover. I told her ‘They do beaches for covers and I’m on a farm. There’s no way. It’s not possible. Cooper performs air guitar to Young’s solo Down By the River on The Tonight Show With Jimmy Fallon. When I was a kid I had a lot of time on my hands and there’s this one song by Neil Young. I don’t know if everybody knows this, and I’m sort of proud that I know it. It’s just the guitar solo from Down by the River, to air guitar to it is so meaningless, but I’d love to give you a little taste. It’s long! Deschanel sings a cover of Springfield’s Stay Awhile on the program.